A handful of Japanese companies have been making their name in the world of wide—wide-body kits to be more specific. Browse the latest rides from SEMA or the top-tier automotive aftermarket Instagram accounts and you’ll find exotic and JDM-spec rides all boasting massive over fenders and an aggressive stance. One of the top names in this space is TRA-Kyoto. Best known for its Rocket Bunny body kits, it seems TRA-Kyoto’s panels could soon be seen on something decidedly more American. 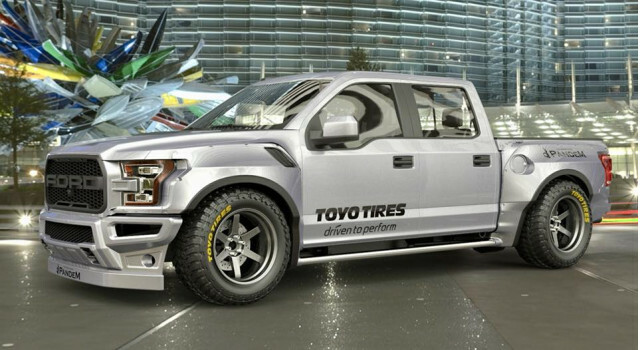 This is your first look at a potential wide-body kit for the Ford F-150 Raptor from TRA-Kyoto’s Pandem line. Some of you are already drooling, while others may be disgusted. That’s part of what makes body kits from Pandem TRA-Kyoto and Liberty Walk so amazing. You can take a car like the Lamborghini Murcielago or Ferrari 458 Italia and push its extreme body language to new, unforeseen dimensions. On the flipside, you’ll often see classic JDM rides transformed into quasi race cars and the result is equally polarizing. Now these kits are finding their way onto American vehicles. The Ford F-150 Raptor seen here is just a rendering at this stage. It’s making its rounds of the Internet because it’s been timed to launch at the Tokyo Auto Salon, which is currently underway. Apparently, this truck will make its real-life debut in the Toyo Tires booth, however, so we’re waiting to see pictures emerge of the real thing. For now, we can only stare at the rendering while imagining the mixed reactions this truck will provoke. Personally, we love it. It’s an aggressive take on an already aggressive machine. If you can applaud a Lamborghini being pushed to new styling directions, then you can do the same for the Raptor. This is a comical machine made moreso and we bet the real version would be a blast to drive and be seen in. Just don’t drive it over any jumps. Then again, that’s what the Raptor is supposed to do, so maybe this type of body kit isn’t a good idea.